House To Hold Hearing On Controversial Census Citizenship Question : The Two-Way Officials from the Census Bureau and Commerce Department are set to testify in May about 2020 census which will ask if respondents are citizens, a question which has sparked lawsuits. 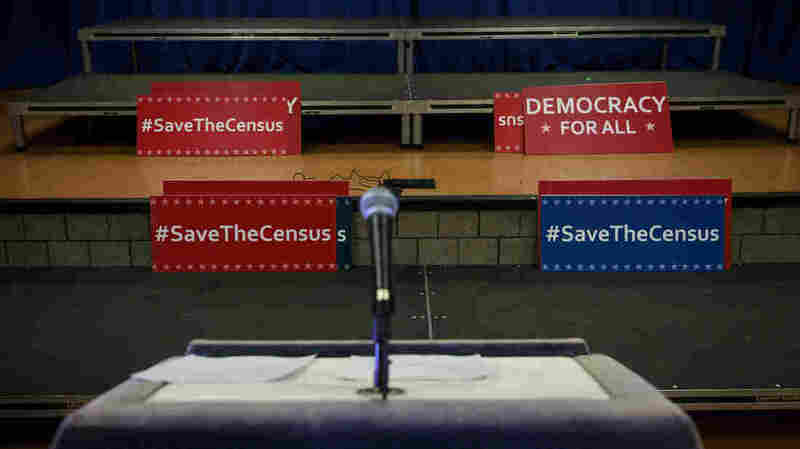 Signs sit behind the podium before the start of a press conference in New York City about the multi-state lawsuit to block the Trump administration from adding a question about citizenship to the 2020 census form. The hearing comes after testimony by the bureau's acting director, Ron Jarmin, during a House Appropriations Commerce, Justice, Science Subcommittee hearing on the 2020 census. It was held weeks after Commerce Secretary Wilbur Ross's announcement last month of his approval of a Justice Department request for a question to be added to 2020 census forms. The announcement has launched lawsuits from more than two dozen cities and states that want the question removed. The Justice Department says it needs a better count of voting-age citizens in order to better enforce the Voting Rights Act's provisions against racial discrimination. But critics of the citizenship question point to the bureau's own research suggesting that adding a citizenship question would discourage noncitizens, including unauthorized immigrants, from participating in the once-a-decade head count of every person living in the U.S., as required by the U.S. Constitution. The population numbers are used to reapportion seats in the House of Representatives, draw legislative districts and distribute an estimated $800 billion a year in federal funds. The announcement of the House hearing comes after a call for a similar hearing by Democratic members of the Senate Homeland Security and Governmental Affairs Committee. Republican Sen. Ron Johnson of Wisconsin, who chairs the committee, has not responded to NPR's inquiries about whether a Senate hearing is in the works. Jarmin and the Commerce Department's deputy general counsel, Michael Walsh Jr. did provide separate closed-door briefings to Senate and House oversight committee members this week about the 2020 census and the newly added citizenship question. Democratic lawmakers on those committees have asked for the Census Bureau and the Commerce Department to give them internal documents related to the decision to add the citizenship question. NPR has filed Freedom of Information Act requests for those documents as well. A spokesperson for the Commerce Department tells NPR that the documents will not be publicly released until they are filed in federal court as part of the lawsuits over the citizenship question. Attorneys for the Commerce Department and the bureau are required to file answers to the legal complaints against them by early June. But Democratic Rep. Elijah Cummings of Maryland, the top Democrat on the House oversight committee, says the Trump administration's refusal to provide these documents to members of Congress before the May 8 hearing is "unacceptable." "We are a separate branch of government, we have our own duty to conduct oversight, and we do independent investigations all the time even when there are outside disputes among the parties," Cummings says in a written statement. "If they continue to withhold these documents from us, we hope Chairman Gowdy will issue a subpoena to obtain them as soon as possible." Gowdy's communications director, Amanda Gonzalez, declined to comment on whether a subpoena will be issued to have the documents released in time for the hearing. Democratic Rep. Carolyn Maloney of New York, who attended Wednesday's briefing for House oversight committee members, says lawmakers need to review the documents to understand why the citizenship question was added despite concerns that it could lower response rates. "This question is not about voting rights," Maloney says. "It's about intimidation. It's about singling out people who are living in the shadows and now may once again be too afraid to say, 'I am here.' "
The Census Bureau has not responded to NPR's inquiry about what Jarmin told House members during the briefing. But Maloney says she asked Jarmin whether the career staff at the Census Bureau expressed any concerns about or support for the citizenship question. She says Jarmin told lawmakers that the staff didn't express an opinion. Maloney's account was corroborated by Democratic Rep. Jimmy Gomez of California, who also attended the briefing and says he found Jarmin's response "strange." "This is an organization that meticulously plans the [census] questionnaire," Gomez says. "And they're saying that they had no one raise concerns, that no one supported it, that no one objected. I find it highly unlikely. We really want to get to the bottom of what are the true reasons for doing it."